I am unable to understand why Govt of India is not ensuring that CPOs donot termed as Para Military by common public and media and also ensuring that Military pattern is not used by them at all.CPOs be kept at their right place and order as a central police organisation.It is also a misnomar to call them security forces,since they are trained for policing duties and law and order problems only. Images like these are used by lobbyists in various countries get the respective govts. to deny a Visa or even a visit to a Visa holder. With regard to the picture in concern, we would've laughed at the people doing it had this emanated from our neighborhood. How does it feel to see our own countrymen being treated like carcasses? Least they can do is provide them dignity in death. Pictures of CRPF carrying dead bodies(specially lady maoist) like dead animal,is too shocking. This is not the way to carry dead bodies .Minimum respect must be given to dead bodies .It has taken India 100 years back in front of the whole world . notification issued to stop misuse by all CPO/security guards with suitable punishment to such users. Some civilians feel proud by having a driver putting a naval officers like white uniform. The photo/writeup under it here, suggests to general public that its army is doing such inhuman things, which fortunately faujis will not do. There is a need to let public at large know clearly the difference in the armed forces and CPOs. If need be, let it be even advertised and emphasised in media.I am sure the media when told the reality will certainly play its part in educating in people who by and large are either ignorant or even ill informed. Armed forces bosses mustnot have any fears or inhebitions in letting their PROs interact freely with media.This is the only way to let the public at large know what armed forces are and what CPOs like CRPF ,BSF etc are.CRPF is a police force and not a Para military like Assam Rifles. People in the Govt neither have any time nor any self intrest in it.We must act our selves before futher damage to our image is done ,may be irrepairabe one. i don't find anything wrong with that photograph. why should the enemy who committed gruesome acts like causing train accidents, killing innocent civilians and killing unarmed CRPF personal be treated with dignity? Their bodies should have been thrown to dogs. A dead body is not a person and there is no dignity in death(however romantic/heroic that idea might seem).All this posturing by the media is ultimately irrelevant.I've seen and treated GSW/mine blast victims in J&K and know for a fact that war is ugly. A dead body is no longer a terrorist. Soldiers fight the will of a person and his philosophy - not individuals. Come to think of it, a dead terrorist too is a soldier in his own right. Did we not do follow the code since Mahabharat? in my view this incident should not be viewed as a means to demean CPO's or para military forces . like there are black sheep's in army they may be even in para military forces . what the para military forces are wearing it it is with approval of govt . i think this example is not a correct example quoted by maj navdeep to prove supremacy of army over para military forces .there are many cases of atrocities done by armed forces on innocent civilians . punishment have been given to guilty . this does not mean that whole armed forces are like this . in my view such behaviour with dead bodies is not correct and guilty must be punished . wearing similar uniform by para military forces akin to armed forces . There was a time when the cloth used for stitching the uniform was never available in open market and that a PBOR serviceman was required to exchange his old uniform for a new one as service issue. Officers were expected to personally destroy their old uniform upon getting the new one.This system had a strong merit as it prevented misuse of old uniform to impersonate -which act is very much an offence under our legal system . Can the Service Chiefs take it up with the Govt to declare open-market sale of all items of uniform (in additon to the cloth) of the three Services and its look-alike as a major offence amounting to an act inciting Mutiny , punishable by life imprisonment? My post is not about the supremacy of the Army over CPOs, no at all ! In fact I hate it when the CPOs are put down in comparison to the Army. In any case, it is not the 'student' who is at fault here but the 'teacher'. The Govt should move ahead with speed to emancipate the CPOs and empower them with tactics and military knowledge. thanks for ur comments on my writing . i understand ur views . para military v/s armed forces . ur r absolutely right , govt should take steps to train para military. I don't think supremacy of any arm of Govt is in debate here. As Maj Navdeep said, just by wearing uniform you can't equate yourself with any other arm of Govt. I think Govt must take a holistic view whether wearing of armed forces uniform by CPOs / paramilitary forces is correct. 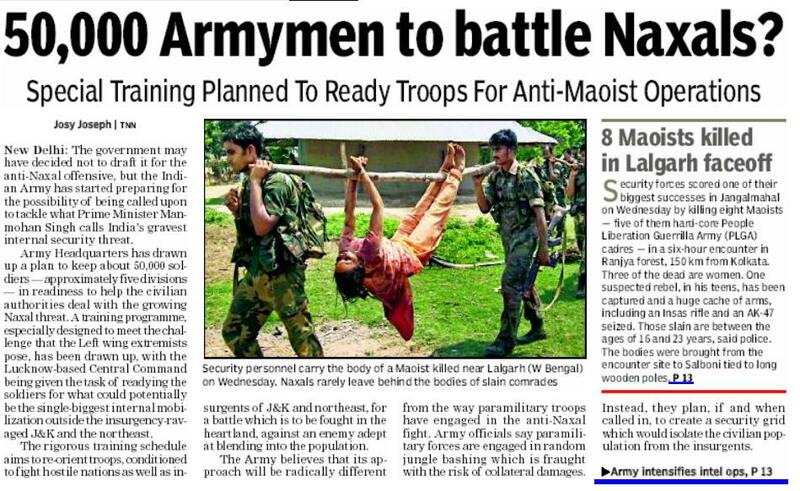 In the least, if you see the photo in question without any captions, you will feel it was the handiwork of army.This image without accompanying captions can be easily used by Maoists to fuel the propaganda against army itself if and when required.I hope you see the point. This picture reminds me of the brutality of BDR soldiers when they had killed some policemen of BSF on Bangladesh Border and then carried them hanging in the similar manner as shown in the picture here. Would someone in India including the defenders of CRPF above ever liked it? No one in J&K or the North East ever accused Indian Armed Forces (does not include police) because of the strong ethos of the IA as brought out by Navdeep. The fault, however, does not entirely lie with the CRPF. It is the fault of their working culture and environment. It is a settled knowledge that one behaves like his past experiences, acquired culture, ethos and culture of the leadership. CRPF, the Crown Reserve Police turned Central Resrve Police has always been an instrument of terrorising the masses in India whether before or after independence. CRPF has been a brutal lathi / danda charging force meant to be applied on the demonstrators, protesters, crowd and other situations where innocent and unarmed populace declared unlawful assembly by a Babu. On the other hand, CRPF personnel had been acute victims of real voilant "Police Thanedary" system wheirin the CRPF men are brought under the Thanedars to commit voilance on the citizenary much more brutaly than the beat constebulary can do that. It has been widely accpted by an IG of J&K in his recent interview to FORCE magazine that the constabulary, perticularly in J&K, can not survive without CRPF becuase CRPF has no "face" and locale. They can commit brutal acts in J&K at the behest of the State police without making the State Police accountable for it. In reality CRPF is a proxy brutal force for the state police or the IPS who dominate it. Thirdly, on another level, CRPF is employed for the menial and low jobs for their Police bosses, perticlarly the IAS, IPS and the politicians. Without any cohesion of the organisation, utility and welfare, the CRPF personnel are distributed amongst them in the name of security and guards as captive and slave labour where they remain for years together without any care. Their officers have no control over their employment or distribution. So the picture is dismal and not favorable for the organisation to be called as a "Force". The culture and employment scenarios have left the force as "brutalised" and "criminalised". This is not my findings or attempts at character assanisation but result of many studies including by the prestigious "Seminar' and "Economic and Political Magazine" in India. One may refer to those. Bad image of CRPF, being used as a proxy force by the IPS is as old as the origin of the force itself.